Here is the complete features of our Pazhaverkadu Plots. Exactly 1.5 Km from Pazhaverkadu Boating Place. 18 Km from Ponneri Railway Station, Ponneri Main Bus Stand, Ponneri Taluk Office and Ponneri Register Office. Exactly 7 Km from Ponneri Residential Smart City Project. 6 Km From Pazhaverkadu – Pulicat Bird Sanctuary. 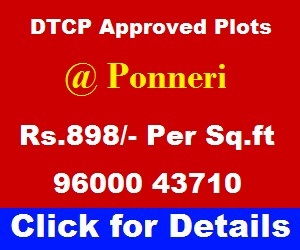 Exactly 3 Km from Ponneri Industrial Smart City. Exactly 2 Km from Ponneri 400 Feet Ring Road. If you want more information, please watch this YouTube video on Pazhaverkadu Plots in Tamil.